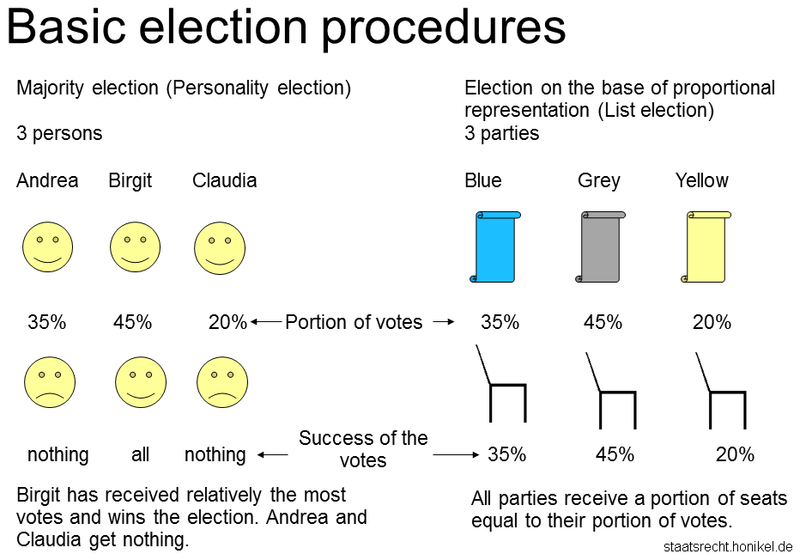 Basic election procedures — Majority election and election on the base of proportional representation. There are two different election procedures, the majority election and the election on the base of proportional representation. Several applicants place themselves to the election. Those applicant with most of the votes (relative or absolute) wins. A received 35 % of all votes, B 20 % and C 45 %. Applicant C relatively received most votes and wins the election. If an absolute majority has been required, the election had to be repeated (second ballot). Several lists with applicant names are available. As much per cent of all votes are allotted to the list as much per cent of all seats the list get. The applicants on the respective list are distributed ascending on the seats. 3 (party -) lists A, B and C, 200 seats are to assign. Party A receive 35 % of all delivered votes, B 20 % and C 45 %. Party A therefore receives 70 seats (35 % of the seats), B 40 seats and C 90 seats. At party A thus the first 70 applicants on the list get a seat, at party B only the applicants 1 - 40 and at C also the applicant with the number 90 at the electoral list receive a seat.